Laurie Strongin is the founder and executive director of Hope for Henry Foundation, which brings entertainment, laughter and smiles to seriously ill children. She also acts as a family advocate in the national discussion of ethics and genetics. She has participated as a panelist and guest lecturer in forums hosted by the Johns Hopkins Genetics and Public Policy Center. In 2006, Laurie joined Congresswoman Nancy Pelosi to urge Congress to pass the Stem Cell Research Enhancement Act. She lives with her husband Allen Goldberg and sons Jack and Joe Goldberg in Washington, D.C.
Henry’s courage and bravery were a source of inspiration for the many nurses, doctors, friends and family who interacted with him– and he has saved many lives through his participation in groundbreaking research. Henry is the inspiration behind the Hope for Henry Foundation, a nonprofit that Laurie and Allen founded in 2003 on what would have been Henry’s eighth birthday. Each year, Hope for Henry brightens the days and the spirits of thousands of kids like Henry whose illnesses force painful separations from their families, friends, school and other activities they love. Why did you remain so public – The New York Times, Nightline, Saving Henry – when you were dealing with such a personal tragedy? From the moment of Henry’s diagnosis with a rare disease called Fanconi anemia, I knew that Allen and I did not have the resources to save Henry’s life alone. We didn’t have the medical expertise, the political influence, or the finances necessary to reverse Henry’s fate. What we did have was the good fortune of caring families and friends, proximity to skilled medical professionals, careers in public relations and boundless hope and determination. We believed that if we made every call and pulled every string that somehow we’d be able to save Henry. But our goal didn’t stop there. We understood that we were the beneficiaries of all the hard work that families facing similar diagnoses had done before us. If Henry had been born five or ten years earlier, he would have had almost no chance of survival. But families like ours had raised money to support research and that research had led to improved treatments from which Henry would benefit. We felt a strong obligation to do whatever we could to help others who would follow behind us. The challenges we faced were daunting. Saving Henry and other children with Fanconi anemia and other fatal illnesses required us to participate in unproven medical trials, break down political barriers and to straddle complex ethical lines. It required us to recruit bone marrow donors and raise money for medical research. It required us to forfeit our privacy. Over the years, we have heard from numerous families who have achieved success through PGD and credit Henry with their children’s survival. Clearly, the benefits of the path we chose far outweighed any costs. Which parts of the book were hardest to write? Which were easiest? I started writing the book that became Saving Henry when Henry was alive. I believed that Henry would survive and wanted to chronicle everything we did with two primary intentions. The first was to give families that would follow behind us all the information that I had longed for, but was unavailable, because we were among the first to use PGD to save a life. The second was that I was certain that when the news of this incredible medical development broke, ethical issues would be raised that I wanted to address head-on. While in Minneapolis for Henry’s bone marrow transplant, I wrote frequent email updates to our family and friends to inform them of Henry’s progress. After Henry died, I needed to write, but this time, my intention was solely personal. I wanted to remember – and even more importantly to explain to Jack and Joe – how hard we fought to save Henry. I spent a couple of years adapting my earlier writing about PGD and Henry’s transplant into what became the first manuscript that I tentatively titled Saving Henry. Writing about the medical treatments and ethics was fairly easy. What was far more difficult was to write about how I felt about Henry and the pain surrounding his illness and death. Even more difficult was writing about all the happy times we shared. Trips to Funland and Disney World. Making snowmen, dancing to Brick House in the family room, watching the boys work their lemonade stands. 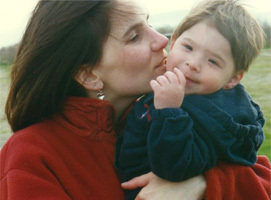 In the face of all this good living, it was simply irrational that my little boy could be dead. One day I was sitting at my desk at Fannie Mae Foundation where I worked, and I couldn’t stop thinking about the day Henry and I first rode the Paratrooper at Funland. I could almost feel the sand between my toes. I could almost smell the greasy Thrashers French fries. With tears running down my cheeks, I started writing, “We were barefoot in Funland…” which appears in the book. Months later, on Henry’s birthday, I was going through one of the many boxes and bags with his favorite things and found a note that Bella had written to him. I spent the day writing “True Love,” which became the first chapter in Saving Henry. In its entirety, Saving Henry is both a love story and a medical adventure. It chronicles our life with and without Henry. It helps me remember everything and will be there for Jack and Joe when they are ready. You describe enduring pretty harsh medical procedures with hundreds of injections and numerous surgical procedures. How close were you to giving up? Each attempt to use in vitro fertilization and preimplantation genetic diagnosis, to ensure that we had a healthy baby and that Henry would survive, required approximately self-administered 40 injections and two surgical procedures. It also meant that I would have to be away from home for several weeks at a time. My overwhelming feeling the first few attempts was of privilege and gratitude that our family had the incredible good fortune to be able to be the first to pursue this life-saving treatment. It may sound crazy, but the injections, while scary, almost felt good, like a surge of life. I needed something to do to retain my feelings of hope for Henry and these medical procedures gave me hope and energy and determination. As we experienced one failure after another, while Henry’s blood counts plummeted, the pain of injecting the drugs into my increasingly bruised and sore thighs was more pronounced. The hardest times, of course, were when we learned that there were no healthy embryos to implant or that I was not pregnant, yet again. Sometimes for just a few moments, other times for hours or several days, I felt empty and desperate and hopeless. But those feelings didn’t stand a chance against Jack’s and Henry’s adorable smiles and zest for life, and Allen’s encouragement. You could have chosen to do many things to honor your son’s life. Why did you choose to start the Hope for Henry Foundation? When Henry was sick, it was relatively easy to access first-class medical care. But even in the best children’s hospitals, there were few resources devoted to enhancing the quality of life for kids like Henry who are spending weeks and months at-a-time in the hospital. Just imagine being a five year-old child stuck in a small hospital room for 40 days straight with only network television. That is what Henry and our son Jack faced time and time again. Allen and I believed that we would not only improve every day, but that we could contribute positively to Henry’s recovery, if we could find a way to deliver as many of the joys of childhood to Henry and Jack as possible. Just because you are in the hospital hooked up to an IV pump shouldn’t mean that you can’t have a great over-the-top birthday party. It shouldn’t mean that you can’t see movies the day they come out. It shouldn’t mean that you can’t go trick-or-treating, or meet Batman. With the help of friends, Henry got to see the Harry Potter movie the day it made its way to the theatres. The same was true of Pokemon 4Ever. He got to meet Superman. He celebrated his birthday, goody bags and all. I really don’t like to think back on how many birthdays, Halloweens, Thanksgivings and Hanukkahs Henry spent in a hospital room/bed/whatever…but that was our reality. 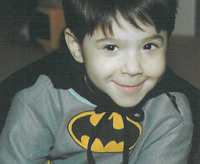 He also lived longer and better than most kids, who were as sick following a bone marrow transplant, as he was. Allen and I believe that there was a connection between Henry’s quality of life and his indomitable spirit. Each year, Hope for Henry does for thousands of children at hospitals around the country what we did for Henry. Hope for Henry brings smiles to these special kids’ faces, hope into their lives and make each day better.